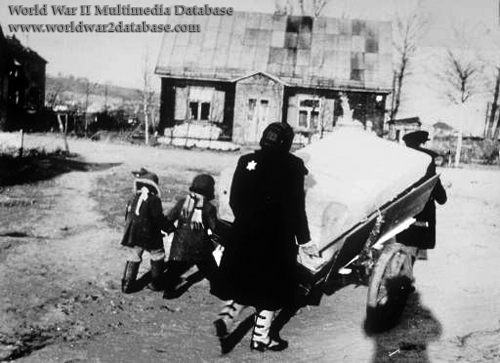 A woman and her three children move their belongings into the Kovno (Kaunas in Lithuanian) Ghetto in June or July 1941. After initial pogroms against Kovno Jews, the Germans ordered the surviving 29,761 Jewish residents of Kovno to move into Vilijampole, known to Jews as Slobodka, by August 15. Vilijampole was the location of Slabodka Yeshiva and had 12,000 residents before the war. Because of the pogroms, Jews started moving into Slobodka even before the deadline of the German proclamation. The Jews were forbidden to use motor vehicles to move into the Ghetto. Kovno's mayor limited the amount of household goods and personal effects the Jews could take with them, but much of the furniture they brought into the Ghetto wouldn't fit anyway in the cramped quarters. Many Jews found they had to abandon furniture as three or four families had to share the same room. Slobodka had no running water. Further crowding occurred as the Germans reduced the size of the Kovno Ghetto four times, starting on August 17 and October 4, 1941, then again on May 1 and October 5, 1942. The shadow in the lower right is that of the photographer, George Kadish (1910-1997). Born Zvi Hirsh Kadushin in Raseiniai, Lithuania, he studied electrical engineering at Aleksotas University and was a science teacher at a Jewish high school before the war. In June 1941, Kadish was encouraged by Yehuda Zupovitz (1918-March 27, 1944), the Deputy Chief of Jewish Police, to document life in the Ghetto after Kadish, an amateur photographer, had already documented the pogroms. Kadish used a Leica camera and made a smaller camera that could be concealed under his coat to take pictures through his buttonhole. Assigned to maintain the X-Ray equipment at a German Hospital, Kadish developed his photos using the chemicals available in the hospital and smuggled the prints out in crutches. Kadish is one of only two Jewish photographers whose work survived the war; among his last photographs are the deportation of Kovno Jews to Estonia in September 1943, when the Kovno Ghetto was turned into a concentration camp. Slabodka Yeshiva was destroyed. Zupovitz was arrested in March 1994 as part of the "police action" that rounded up the Jewish Police and refused to betray Kadish even under torture. Zupovitz and 36 other Jewish Police were shot in Kovno's Fort IX on March 27, 1944. Kadish buried his photos in milk cans in the Kovno Ghetto and swam across the Vilya River to Konvo to escape the Gestapo. When the Kovno Ghetto was destroyed by the Germans as the Russians advanced in July 1944, Kadish photographed the destruction from the other side of the river. The Red Army occupied Kovno in August 1944. Only 3,000 of Kovno's 37,000 Jews survived the Holocaust. Kadish returned to the ruins of the Ghetto and dug up his milk cans. His photos had survived. After the Germans surrendered, Kadish went to Landsberg Displaced Persons Camp in Germany. While in the Displaced Persons camps Kadish presented his photos in exhibitions, photographed DP camp life, and collected Holocaust photos from other survivors. Kadish moved to the United States, taking his photo collection with him. He died in Hollywood, Florida in August 1997.